Leeds is one step closer to having the largest rail test facility of its kind in the world. 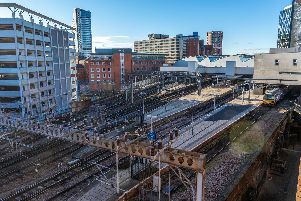 Plans to create a new Institute of High Speed Railways in the city went before a regional transport body, which agreed to help fund final plans for what has been seen as a “game-changer” and a “catalyst” for economic regeneration. Prof Peter Woodward from Leeds University gave a presentation to members of the WYCA investment committee outlining the plans for the institute, which would become a hub for high-speed rail innovation for both track and train technology. He said: “We are about to have more than £100bn worth of investment coming into the rail industry in the UK, with Leeds at the very heart. “(The institute will) for the first time, put advanced, world-leading test facilities at the heart – not only of the industry – but of enterprise. The strength that has been developed will be the game-changer, it will be the economic regeneration catalyst for most of the region. “It will allow us to look at advanced manufacturing for the city – so you can imagine the wealth generation and prosperity that will bring, in terms of putting the Leeds City Region on the world map. He said the project will be carried out in three phases over a number of years, the first phase being the creation of the new test facility. This would cost £26m – half of which was today approved by the West Yorkshire Combined Authority investment committee. This would include two facilities near Temple Newsam; one would test tracks, the other would test trains. It is hoped these will be completed by December 2020. Prof Woodward added: “It is the biggest test facility in the world in terms of laboratory infrastructure. “The test facility will be the first of its kind in the world – it will have programmable track geometry. That means I can put in the full track geometry and alignment from, say, Kings Cross to Edinburgh, and run through the full duty cycle of the train. “It is also unique, because it connects with the infrastructure test facility which already exists at the university. Coun Peter Box, chair of the West Yorkshire Combined Authority investment committee, said: “Developing the Institute for High Speed Rail and System Integration with the University of Leeds will mean that the Leeds City Region, already at the cutting edge of the digital, manufacturing and innovation sectors, will be home to a unique research, innovation and training facility. The next stage of the scheme will be to develop a full business case with finalised costs. Professor Lisa Roberts, deputy vice-chancellor of research and innovation, at the University of Leeds, added: “This is a very welcome investment in the Institute, supporting the development and construction of the country’s high speed network. It will create jobs and skills opportunities, and positions the region and the UK as pioneers in modern high speed rail technologies.